Madame Sophia LaRoque has done it again. A local man came to her shop in New Orleans to get her help filling out an NCAA tournament bracket for his office pool, which would deliver a big prize to the most accurate one. 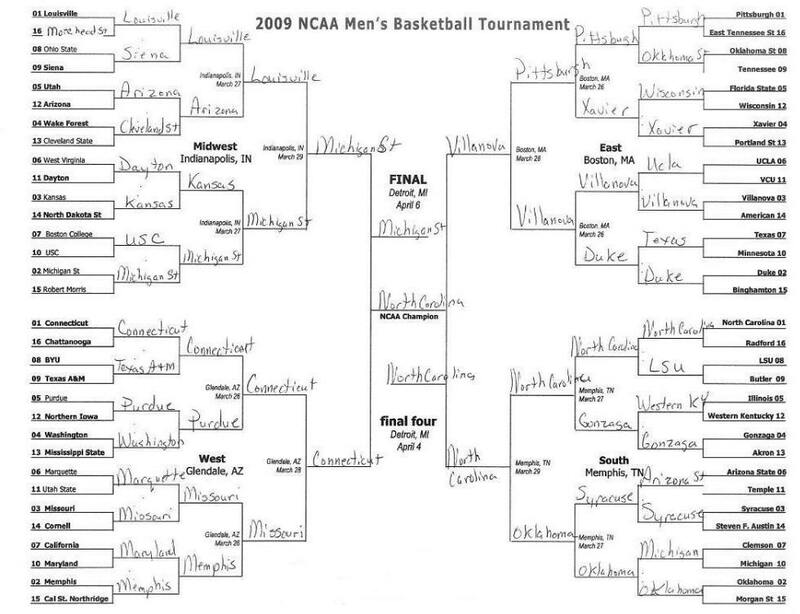 Not only did her predictions win his office pool, but she produced a perfect bracket, a statistical near impossibility! I spoke to "Steve" as I will call him to protect his identity from his office mates who would call him a cheater, and possibly hurt him. "After reading about her predictions for the year 2008", said Steve, "I had to try asking her to fill out my tournament bracket. She was reluctant at first, but finally agreed at a fee much higher than she usually charges. Although I paid her a lot, it was much less than what I won in the office pool. It really blew everyone's mind at the office. I even got an extra payoff from the boss who bet that no one could fill out a bracket with every single game right." He showed me his bracket, which is pictured below. I asked Madame LaRoque about it myself. She told me that she usually refuses people who want help with gambling, but something about this man made her change her mind. "I looked into my crystal ball, and saw the ends of each game, all the way up to the championship. I saw the rejoicing of the victors, and the sorrow of the losers." I also asked her if she could do the same for the lottery or Vegas. "No," she told me. "There is a hex on the lottery that will cause terrible suffering to any psychic who tries to look ahead to its results; a powerful form of black magic, and I cannot break the spell. Casinos also often employ witches and sorcerers to protect themselves from seers who want to take the risk out of gambling. Luckily for me, the NCAA does no such thing." There you have it. Everyone keeps saying that no one can predict just what is going to happen in March Madness, but Madame Sophia LaRoque did.